Tom Mlada has proudly served as a member of the 1000 Friends of Wisconsin Board of Directors since 2016. His participation with 1000 Friends spans a number of projects during his six-year tenure as Mayor of the City of Port Washington, including various Active Community and Green Tier Legacy Community Program related initiatives. These efforts were often focused on making the City of Port Washington more walkable, bikable, sustainable, and recreationally accessible for all. 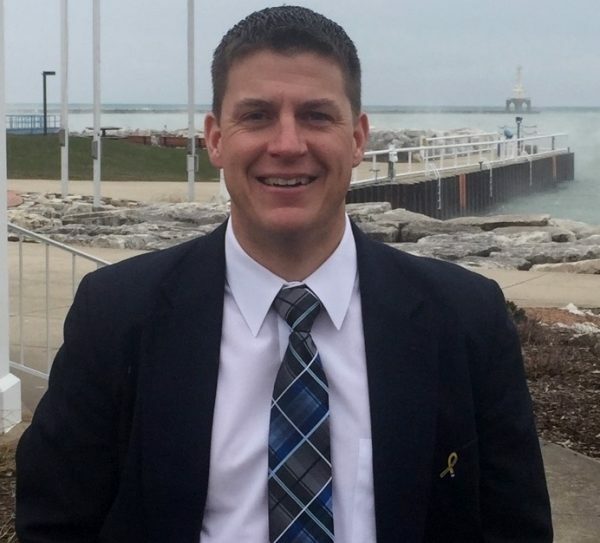 As Mayor of Port Washington from 2012-2018, Tom championed the push for pedestrian connectivity, spearheading the first Active Community Environments (ACEs) Team in Ozaukee County, and advanced the cause of environmental stewardship and sustainability, launching the City’s Environmental Planning Committee to lead forward the efforts. He played a vital role in securing a $1 million federal appropriation for repair of the federally-owned breakwaters protecting the City harbor, and then worked to obtain matching dollars totaling over $3 million to help fund additional stabilization and improvement work. Additionally, Tom passionately embraced the opportunity to serve as a primary representative for the City in its efforts to work with regional partners and on behalf of the State of Wisconsin to attain a National Marine Sanctuary designation for a defined area of Lake Michigan stretching from Port Washington to Two Rivers. The Mlada family – Tom; wife Kathy; daughters Olivia (16), Evelyn (11) and Aubrey (7); and dogs Jack (5) and Bruno (1) – now call the Village of Grafton home, after previously residing in the City of Port Washington for 19 years. Tom and Kathy are both proud possessors of Bachelor of Arts degrees from St. Norbert College in DePere, Wisconsin, with Tom majoring in Economics and an Environmental Policy concentration.